The 2017 National Conference on Health Professions Education (NCHPE) was held November 7-11, 2017, at Jorhat Medical College (JMC) in Jorhat, India. The theme of the conference was, “Faculty Development: Expanding Horizons…Fostering Change.” The NCHPE provides a platform for key stakeholders in health professions education in India to share scholarship, research, experiences, and educational strategies. Its annual offerings include keynote addresses by renowned speakers with firsthand experience in specialized fields of education, panel discussions led by national experts, and small group work involving faculty from all over India. The NCHPE has been held nine times between 2007 and 2017, at various locations across India. Originally called the National Conference on Medical Education, the NCHPE was soon expanded to include all health professionals and is now an annual event. This year’s conference was especially notable, as it was held for the first time in the eastern region of India. This part of India has ample medical colleges, but there is less focus on faculty development in health professions education when compared with the rest of India. The Academy of Health Professions Educators (AHPE) was formed as a result of the NCHPE, and has organized the conference since 2009. AHPE is a national non-governmental organization of health professionals who have interest in the development and advancement of health professions education in India. The core purpose of AHPE is to improve the standards and quality of health professions education in India at all levels—undergraduate, postgraduate, and continuing professional development—in alignment with the goals of the World Federation for Medical Education (WFME) and the South East Asia Regional Association for Medical Education (SEARAME). A number of FAIMER Fellows and faculty members serve in leadership roles for AHPE and the NCHPE—including Dr. Thomas Chacko (PHIL 2004), Director of the PSG-FAIMER Regional Institute, who currently serves as AHPE’s President. Dr. Anshu (CMCL 2007, PHIL 2009) and Dr. Nirmala Rege (PHIL 2015) serve, respectively, as AHPE’s Secretary and Treasurer. Dr. Purnima Barua (CMCL 2015) served as organizing secretary of NCHPE 2017, and says that the conference has been a turning point in the field of health professions education in the region. “It has been instrumental in sensitizing the faculties, bringing them to the mainstream, and opening opportunities for networking,” she shares. “The conference has also helped strengthen the Medical Education Unit of JMC and provided an opportunity to all of its members to display their organizing and team work skills.” Dr. Barua notes that support from state government officials from the Directorate of Medical Education and the Department of Health and Family Welfare was instrumental to the success of the conference, which was also attended by key representatives of the Medical Council of India. In June 2014, the GSMC-FAIMER Regional Institute welcomed its 10th class of Fellows and celebrated this important milestone at Seth G.S. Medical College in Mumbai, India. 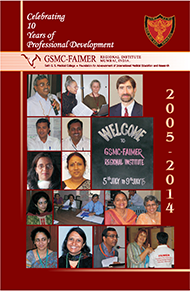 GSMC-FAIMER, the first of FAIMER’s Regional Institutes to be developed, was launched in 2005. A total of 175 health professions educators from seven countries have participated in the fellowship program, under the direction of Dr. Avinash Supe, Professor and Head of the Department of Surgical Gastroenterology at King Edward Memorial Hospital and a FAIMER Institute 2002 Fellow. Many alumni returned to join current fellows, faculty, and special guests for the 10-year anniversary celebrations. FAIMER Regional Institutes are modeled on the curriculum of the flagship FAIMER Institute fellowship program held each year in Philadelphia, Pennsylvania. All of the programs include both residential and distance learning sessions. To date there are six Regional Institutes: three in India, one in Brazil, one in Sub-Saharan Africa, and one in China. Two new programs, one in Colombia and another in India, are currently being planned for launch in 2015. Visit the Regional Initiatives page of this website for more information. The sixth National Conference on Health Professions Education (NCHPE 2014) will be held September 24-27, 2014, at the Mahatma Gandhi Institute of Medical Sciences (MGIMS), Sevagram, India. The theme of NCHPE 2014 is “Socially Responsive Health Professions Education: Forging Partnerships between Academic Institutions and the Healthcare Delivery System.” Conference objectives are to: advocate the need to transform health professions education and improve the quality and relevance of health professionals in order to strengthen their impact on health care in India; identify successful models of partnerships between academic institutions and the health care delivery system and share best practices; and develop recommendations to expand the health force and improve the alignment between health care professions and community health needs. Registration for NCHPE 2014 closes on August 31, 2014. For more information, visit the conference website at: http://www.nchpe2014.com/. The 2013 National Conference in Health Professions Education (NCHPE) is accepting abstracts of work in health professions education through July 15, 2013. NCHPE 2013 will be held September 24-28, 2013, at Seth G.S. Medical College and K.E.M. Hospital in Mumbai, India. The theme of this year’s conference, “Progress through Partnership,” was developed around the idea that in order to translate social accountability into practice, appropriate partnerships must be nurtured through educational collaborations. NCHPE 2013 will provide participants with an opportunity to interact with health professions educators from different backgrounds and explore the strengths of working through partnerships. The conference offers sessions based on partnerships at various levels and for various contexts, in hopes of empowering participants to build fruitful relationships. For detailed conference information, please visit https://sites.google.com/site/nchpe1/home.